Monday to Thursday 9 am to 7 pm. Friday 9 am to 5 pm. 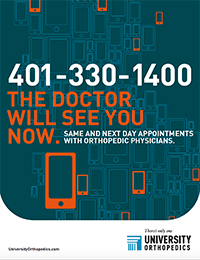 OrthoDIRECT, located at our Kettle Point location, joins University Orthopedics with clinic locations in Providence, Middletown, East Greenwich and Barrington, University Orthopedics is a regional center for orthopedic and rehabilitation care with specialties in back and neck pain, joint pain, sports medicine problems, shoulder pain, hand problems, hip and knee pain, pediatrics and foot and ankle injury. 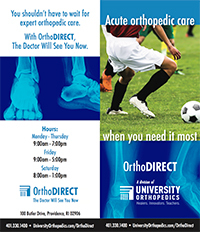 UOI includes more than 40 board certified, fellowship trained musculoskeletal and sports medicine physcians. These specialists are faculty members of the Department of Orthopaedics at the Warren Alpert Medical School of Brown University who teach medical students, orthopedic residents, and fellowship subspecialty surgeons. 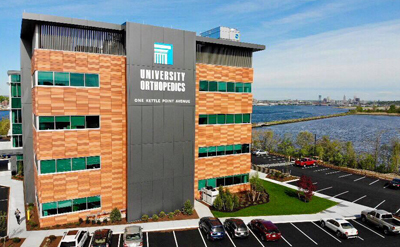 University Orthopedics leads the way with Basic and Clinical orthopedic research on the latest advances in orthopedic surgery and injury prevention.